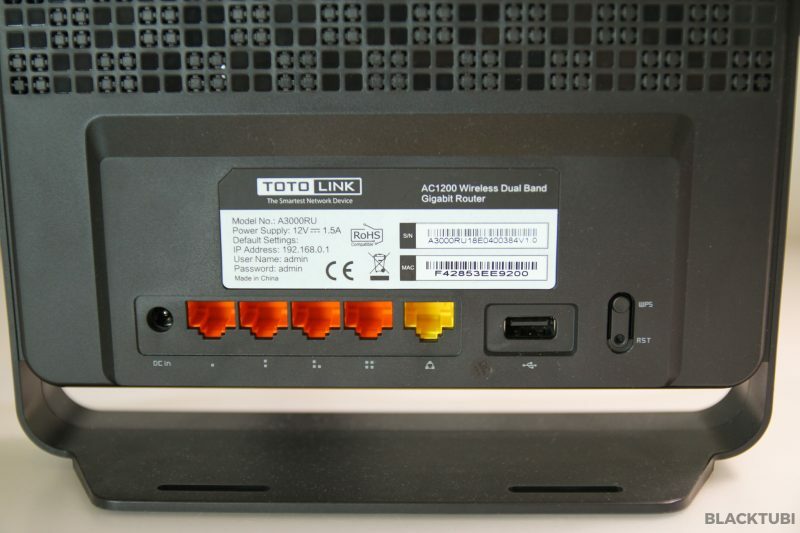 TOTOLINK is probably one of the least well known brand in the networking market. They recently launched their routers in Malaysia so I decided to give them a shot and see how good they are. 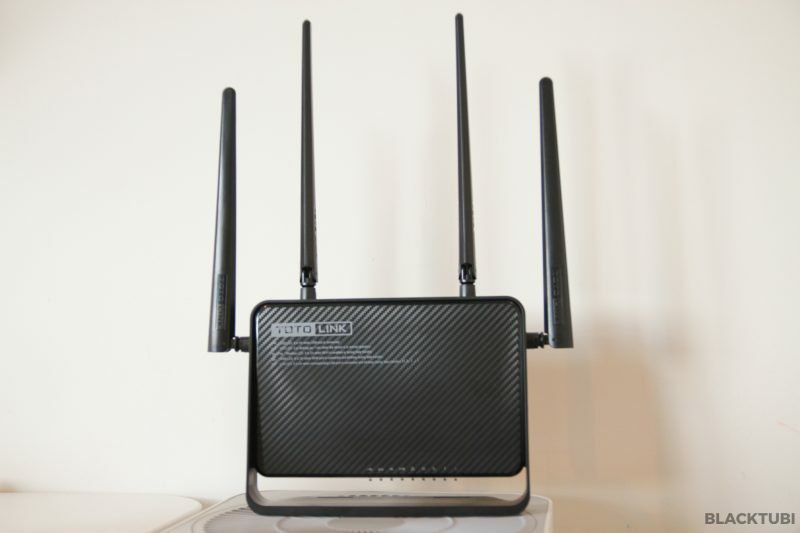 We will be checking out the A3000RU, a really cheap AC1200 wireless router. The model I got is the A3000RU. The routers is designed to be standing all the time as it cannot be laid down. This can potentially help with signal as users will be less likely to obstruct the wireless router. There are 4 non-removable external antennas. The specs are rather basic as this is a low end wireless router. It comes with wireless AC1200 with MU-MIMO support. The router also comes with a USB port and 4 Gigabit Ethernet ports. The Gigabit Ethernet ports will be helpful for Internet more than 100Mbps on wired LAN. 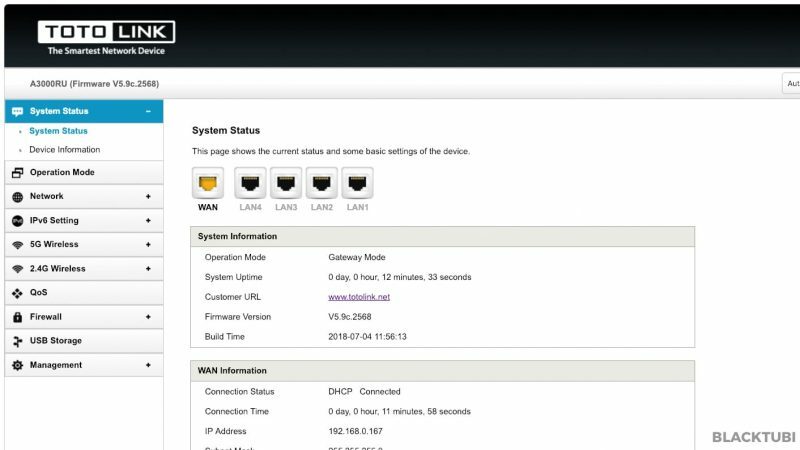 This will be my first time reviewing a TOTOLINK router so the firmware is rather fresh to me. It is fairly easy to navigate around. It doesn’t have a lot of value added features but it does have a lot of advanced configurations which most users will not use. As for features, there is simply not a lot of them. There is a bandwidth limiter and it supports multiple SSID for the WiFi. It is not a guest WiFi feature so there will be no segregation in the network. 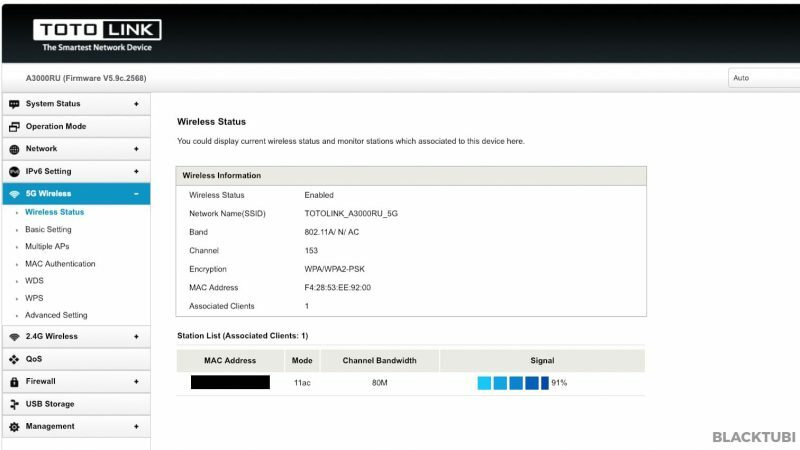 This wireless router also support being used as a wireless repeater, bridge mode and WISP mode which is actually an AP mode. Configuring the TOTOLINK is rather straight forward. 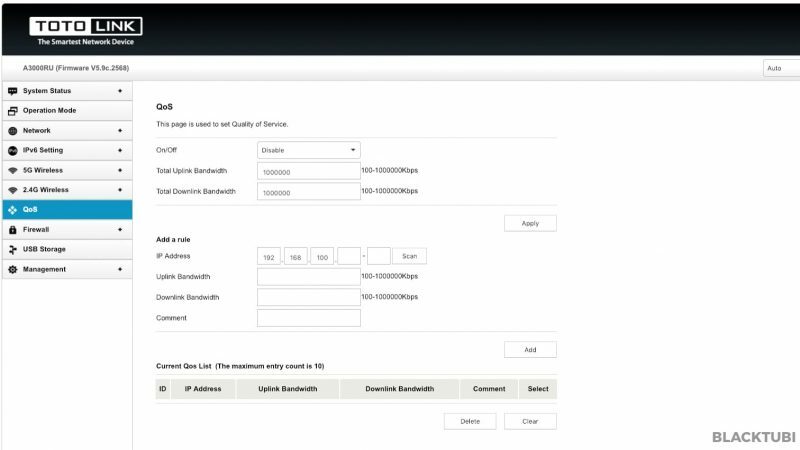 It is preconfigured with Unifi VLAN profile as default out of the box. So, if you do not use Unifi, you will first need to disable the profile. 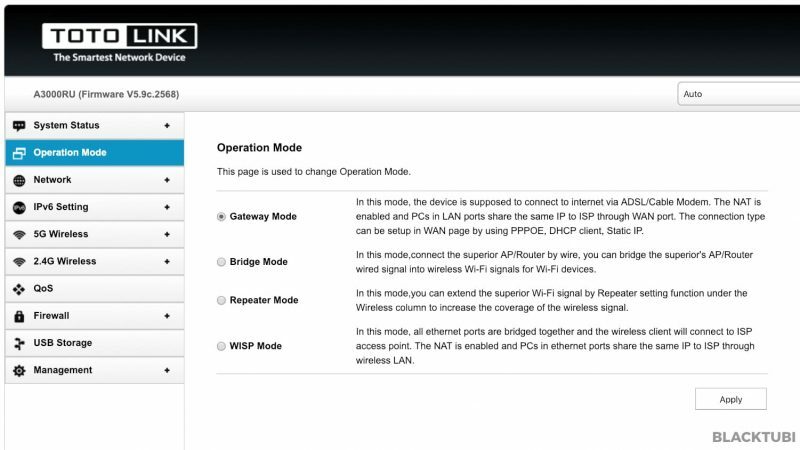 Then you just proceed to select the PPPOE option and insert your Unifi username and profile. You can refer to the image above on where to select Unifi mode. The HyppTV should be connected to LAN 1. As this is an affordable basic router, we are not expecting super fast WiFi speed. We will be testing this on a laptop with a AC1200 wireless receiver and conducting speedtest using Speedtest.net. The test will be repeated over 2 distance, a short distance of 3m from the router and 7m from the router with a wall in between. 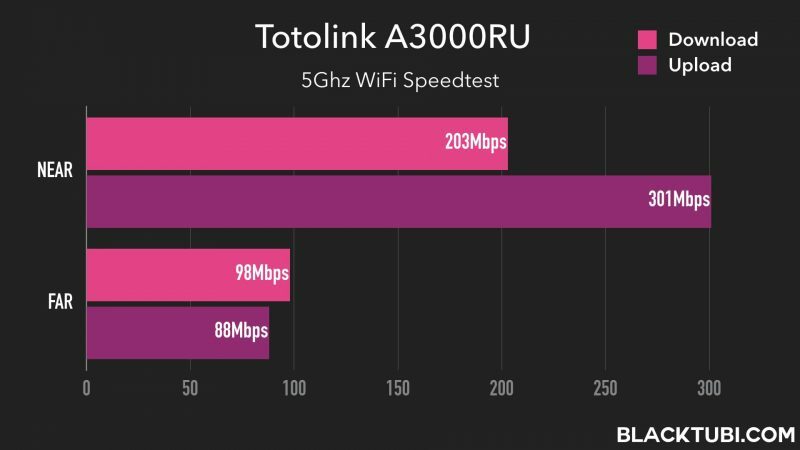 The results aren’t particularly impressive and rather mediocre but it is expected from a wireless router in this range. But, the router is at least delivering stable wireless speed and we do not observe any drops of packet loss in our test. TOTOLINK is a new brand here and they only sells affordable in our market now. 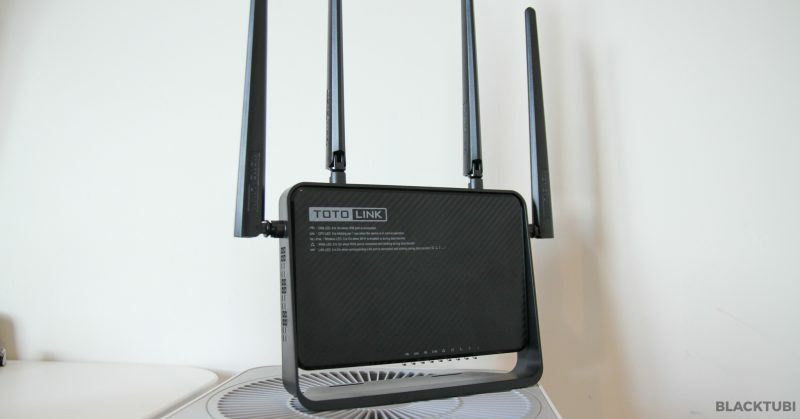 TOTOLINK A3000RU is an affordable wireless router with AC1200 wireless support. It will deliver a stable WiFi connection and we recommend it to user with an internet connection up to 100Mbps. Hi, i wanna ask about router replacement that have usb port, which one more stable, better coverage and good firmware. right now, i got this tm router dlink 842.
dlink 842, RT-AC1200G+, TOTOLINK A3000RU ? i’m unifi 50mbps might get turbo soon. thanks. RT-AC1200G+ is definitely the best among the 3.